#1 NEW YORK TIMES BESTSELLER! This NEW must-read fantasy from an author who is legend herself--TAMORA PIERCE--is one Bustle calls "the perfect book for die-hard Pierce fans and newcomers alike." "I take more comfort from and as great a pleasure in Tamora Pierce's Tortall novels as I do from Game of Thrones." TAMORA PIERCE is the #1 New York Times bestselling author of over eighteen novels set in the fantasy realm of Tortall. She first captured the imagination of readers with her debut novel, Alanna: The First Adventure. Since then, her bestselling and award-winning titles have pushed the boundaries of fantasy and young adult novels to introduce readers to a rich world populated by strong, believable heroines. Her books have been translated into many languages, and some are available on audio from Listening Library and Full Cast Audio. In 2013, she won the Margaret A. Edwards Award for her “significant and lasting contribution to young adult literature.” Pierce lives in Syracuse, New York, with her husband, Tim, and their cats, birds, and occasional rescued wildlife. Visit her at TamoraPierce.com and follow her on Twitter at @TamoraPierce. "Tamora Pierce is one of the queens of fantasy, and as a fan of The Immortals series most of all, I was happy to be reunited with the world of Tortall and literary crush, Numair Salmalín." 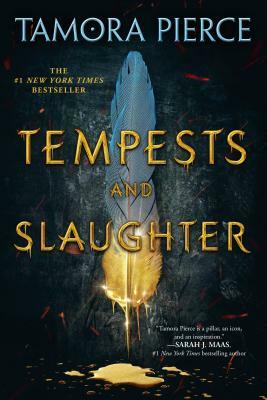 "Rich in world-building detail, Tempests and Slaughter is a slow-burner that illuminates the personal and political intrigues at the heart of the Immortals quartet."